When people around the U.S. visit a Christmas tree lot in search of the perfect holiday plant, there's a possibility they're considering trees grown in the Pacific Northwest, maybe even Estacada. The Pacific Northwest Christmas Tree Association noted that 92 percent of the area's Christmas trees are exported out of the region. Large markets include California, which receives 45 percent of the trees, and Mexico, which receives 16 percent of trees. 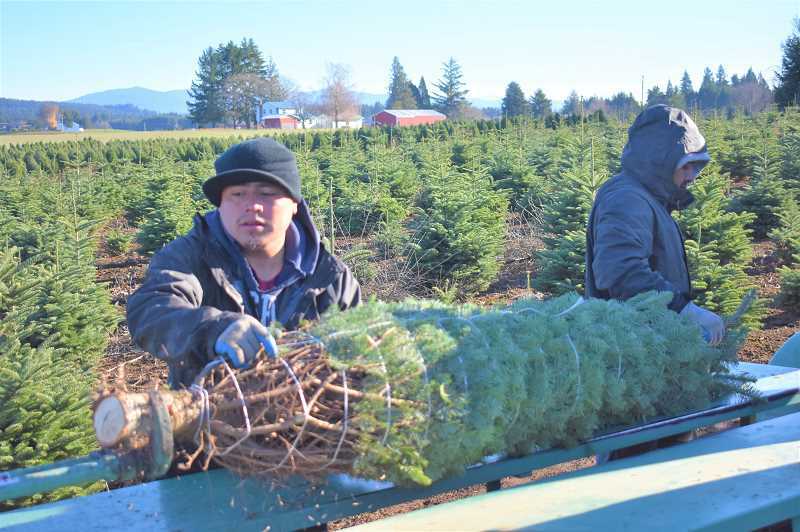 Clackamas County is among Oregon's counties boasting the largest amount of holiday tree production, with a number of farms in Estacada and Eagle Creek. Cory Miller has been at the helm of Deep Creep Tree Farms for more than 30 years. 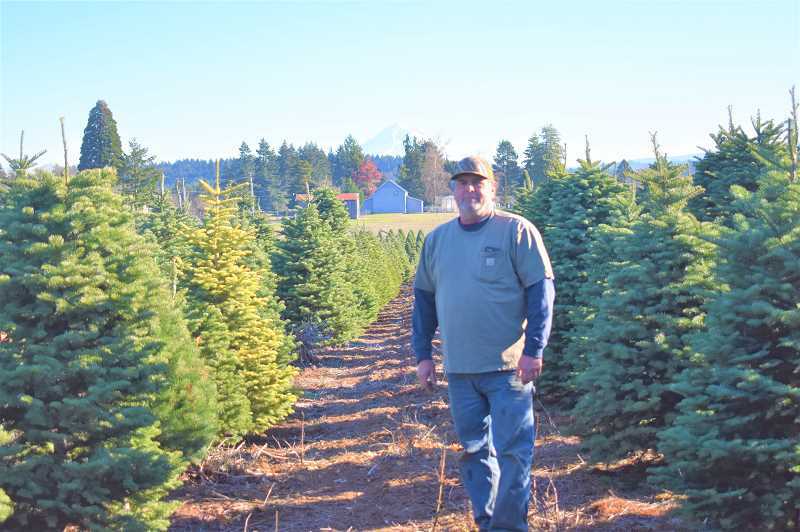 With land in Estacada, Eagle Creek, Sandy and Beavercreek, they harvest between 10,000 to 15,000 trees each year and ship to Mexico, California, Utah, Washington and Oregon. Additionally, they operate a retail lot at 2330 N.E. Hogan Drive in Gresham. vest around 10,000 trees annually and mainly ship to California. "A lot of people in Estacada were growing trees. We just fell into it," said Miller. Christmas trees are a long term endeavor and take approximately 10 years to reach their full size. This often makes it difficult for farmers to predict how many trees they should plant. "You don't know the market. You're at the mercy of supply and demand," Miller said. Grochowsky said knowing the market's cyclical nature is helpful. "You get your cycles going," she said. "Trees will stay in the ground for 10 years, so plan for that. You figure out what numbers you want and stick with that." Miller noted that prices of trees are higher this year because a decade ago, a poor economy led to fewer trees being planted, which has now resulted in a tree shortage. Warm and dry summers and a seedling shortage have also led to fewer trees being available. Because of higher demand, prices of trees have increased — this year, a seven foot tree at Deep Creep Farms costs about $50, compared to $13 for the same type of tree in 2010. "It's a good time to be a tree grower, but it's a hard time to be a buyer," Miller said. "I've had more calls this year because people can't get trees." Though it's a profitable time to be a Christmas tree farmer now, this was not always the case for much of the past decade, when an oversaturation of trees caused prices to decrease. In spite of the difficulties this caused, many farmers knew the situation would likely change for the better. "If you do this long enough, you know things will turn around," Grochowsky said. "The market fluctuates. It's really (cyclical)," Miller added. "Everybody makes money so they plant trees, and there's a glut so prices go down. They see money, they plant trees, and then there are too many trees. It's really seesaw-y." Though some have opted to celebrate the holiday with artificial trees, Miller said that has not been a significant influence on sales. "They have (impacted sales) but not to the extent that it hurts," he said. During the harvest season, Deep Creek Farms cuts, bales and ships anywhere from 500 to 1,000 trees per day. The off-season consists of planting, fertilizing, spraying for weeds, sheering and tagging the trees for customers. Miller noted that each day consists of something different. "Everything changes. There are a lot of variables depending on the weather," he said. "That's a big factor to get trees out of the field." Both Grochowsky and Miller said the work is difficult but rewarding. "It's a lifestyle. You care about the trees all year. People think you plant them and come back in 10 years, and that's not the case," Miller added. "People don't realize that they take so long to grow. Trees are a long term investment."